Caroline County was established in 1728 from the upper portions of Essex, King and Queen, and King William counties. Its name honored Caroline of Anspach, consort of King George II. Some further territory from King and Queen County was added in 1742 and 1762. There have been no further boundary changes since then. Adjoining Caroline is Spotsylvania to the northwest, King George on the northeast, Hanover to the southwest, and King William, King and Queen, and Essex to the southeast. The earliest settlers to the region came in the 1650s, attracted by the cheap land and access to the deepwater wharves of the Rappahannock River. Its population increased rapidly, and throughout the eighteenth century, Caroline county was one of the most populated counties in all of Virginia. Like many counties in Virginia during the Civil War, a number of court and official records were burned or lost during the conflict. The irony is that only a complete set of Court Order books have survived. These were not sent to Richmond for "safe-keeping" by Confederate authorities and consequently were not among the great mass of Virginia county archives which went up in flames during the retreat from Richmond in April, 1865. CAROLINE COUNTY, VIRGINIA LAND BOOKS, 1782-1795: Volume One; District A (St. Mary's Parish & St. Asaph's [Drysdale] Parish) Compiled & abstracted by Ray Campbell, 2019, vi, 8"x11" format, 334 pages, index. As the Revolutionary War was winding down and peace negotiations were being held in Paris, the states began to look at their economic prospects and the results of the war. Colonial buying power had dropped by half since 1775 and specie was in extremely short supply. Virginia, like its sister states, was casting in search of permanent sources of revenue for the operation of government. In 1782 the General Assembly of Virginia enacted a major revision of the tax laws of the commonwealth. The act provided for statewide enumeration on the county level of land and certain personal property. The early land tax law required the tax commissioner in each district to record in “a fair alphabetical list” the names of persons owning land or town lots, the quantity of land owned, the value of the land or lots, and the amount of tax owed. Each tract or lot owned by an individual was to be entered separately. During the American Revolution, the Committee of Safety for Caroline County divided the county into two districts for defense purposes. District One or A was the area northeast of the Mattapony River (St. Mary’s Parish, formerly Essex County) & Drysdale Parish, (formerly King & Queen County). Additionally, St Asaph’s Parish was created from the upper end of Drysdale in the year, 1781. District Two or B was the area southwest of the Mattapony River (St. Margaret’s Parish, previously King William County, which was a part of King & Queen before its formation). After the American Revolution, the tax rolls for the county carry these designations. CAROLINE COUNTY, VIRGINIA LAND BOOKS, 1782-1795: Volume Two; District B (St. Margaret's Parish) Compiled & abstracted by Ray Campbell, 2019, vi, 8"x11" format, 226 pages, index. A continuation of Volume One, covering the remainder of the county (St. Margaret's Parish). At a Meeting of Christ's Church at Coutnty Line: Minutes of County Line Baptist Church, Caroliine Co., VA, Sep. 1829 - May 1856 8 1/2" x 11" format, xii, 195 pages, index. Transcribed and edited by Ray Campbell, 2016. This book is an interesting look at how one small church functioned in the early to mid1800's. A Constitution was written as well as Rules of Decorum and a List of Members (both Caucasian and African-American) was compiled and notations made as to their inclusion in or exclusion from the church. This church did not function in the same way that most churches operate today. At the present time, if you don't want to go to church, you just don't go to church. You may encounter a "Where were you last Sunday? ", but that is about it. Back in the 1800's, if you were absent more than three Sundays, this church appointed a committee from the male members of the church to inquire as to your reason for being absent. A committee would also be appointed to investigate other matters which came before the church such as getting drunk, attendance at a barbecue, dancing or allowing fiddling and dancing at your home, attending communion with the Campbellites (Christian Church) as well as more traditional infractions such as stealing, assault, marital conflict and strife, fornication with its sometime predictable results and "base conduct" (whatever that was). Once the matter was investigated, the person or people investigated were required to attend church and provide an explanation to the congregation. In most cases, an admission of guilt accompanied by a declaration of repentance would allow the "sinner" to full restoration of all rights as a member of the church. Legal conflicts were also mediated by the church and filing a suit in court was prohibited unless permission from the church was granted. Caroline County, Virginia Colonial Census, 1650-1773 [St. Mary's District, 1650-1770; Drysdale District, 1655-1773; St. Margaret's District, 1673-1770 8 1/2" x 11" format, viii, 315 pages. Abstracted by Ray Campbell, 2016. This work is based on other secondary sources. These sources are primarily the Cavaliers & Pioneers series of abstracts of Virginia Land Patents by Nell M. Nugent and the Virginia Genealogical Society and Colonial Caroline by T.E. Campbell. ...No one canvassed Caroline County in the seventeenth century with a clipboard and questionnaire containing queries such as “What is your median income and how many individuals are in the household?” In fact, no census was taken in Virginia until the year, 1790. This “constructed” census is my best guess as to who most probably would have arrived in the area to become Caroline County in a particular year. This book attempts to list those individuals who received a land grant (patentees) and those individuals who were arriving in Virginia (transported). No death records have survived for the early period and the mortality must be presumed to be high. Caroline was formed from three parent counties: Essex, King & Queen and King William. Essex was formed from Old Rappahannock County and included everything in the watershed of the Rappahannock River. King William County was formed from King & Queen, which previously had been formed from New Kent County. Each county contained at least one established Parish of the Church of England (Anglican). Thus there were three parishes in the area to become Caroline prior to the establishment of the county in 1727/8: St. Mary’s (Essex), Drysdale (King & Queen) and St.Margaret’s (King William). The ancient parish registers for all three of these parishes are missing and presumed destroyed. ...Through his representatives, the King of England gave fifty acres of land to every person who immigrated into the Colony of Virginia. These “head-rights” could be bought and sold between parties. The enforcement seems to be a bit slack, in my opinion. For instance, you often see two people of the same or similar names claiming a headright in two different locations on the same date or within a short period of time. The probability of two distinct individuals having an extremely unusual name and appearing in close proximity at practically the same time approaches the realm of impossibility. As the population increased over time, the Crown came to accept cash payments for land grants as well as transportation of an immigrant. If a grant lists a monetary consideration but has no acreage listed, then it is possible to calculate the acreage from the sales price by examining grants that give both consideration as well as acreage. Finally, this work is not intended as the only possible list of inhabitants who resided Caroline in any particular year. There may have been and most probably were other people who settled in Caroline without receiving a land grant or obtaining a head-right. Some hearty individuals such as Howell Powell may have just come into the county and hacked a homestead out of wilderness without bothering to obtain a headright or file any claim. Times were both good and bad and Caroline had both good and bad people. Additionally, things were always on the move as people came and went. This area was just as “wild and woolly” as any place in the Old West. It takes an especially hearty person to face the hardships of the frontier and it takes that same determination to face new challenges once the old frontier has vanished and new horizons appear. Patent Book 5 page 407 (468). Caroline County, Virginia 'Lost' Wills, 1727-1852 and Related Records from other Sources: Volume One 8 1/2" x 11" format, xv, 332 pages. Abstracted by Kimberly Curtis Campbell, 2012. This volume contains the earliest extant wills for Caroline County. This series will try to fill in the records gap that exists by using a variety of original sources. Caroline County was formed in 1727, from King and Queen, King William and Essex Counties. Many of the early records have been destroyed. Surviving records often leave more questions than answers. The Order Books are substantially intact from circa 1732, and show where a Will was presented and proved in Court. These Court records are poorly indexed, if at all, and generally give only one line of information. One history of the county, Colonial Caroline, by T. E. Campbell, lists probate records from the Order Books through 1781, which give only the scant information listed in this secondary source. Extensive research is generally required to obtain a copy of the particular line in the appropriate Order Book. [That is, someone must read the orders from the appropriate period and be able to recognize one name written in old script.] Only a few "loose wills" and Will Book #19, November 1814 to July 1818 have survived prior to 1853. This book, and future volumes, is an attempt to relocate Caroline Counties "lost wills" from other sources and localities. The exact causes of the "records gap" are unknown. Early Clerk's offices were not environmentally controlled as they are today. Pest control was yet another problem. Add to this fire, flood, war and we are fortunate to have what remains. William L. Hopkins book Caroline County Court Records and Marriages, 1787 1810, at page 196, Elizabeth Saunders states she and her husband were married "in 1792 prior to the burning of the clerk's office in 1800". In Marshall Wingfield's, A History of Caroline County, Virginia, at page 273, Robert Hudgin is quoted as to the deplorable condition of the records in 1827 and he received a "vote of thanks" from the justices of the court for his efforts to organize and preserve them. One Will for Daniel DeJarnette, recorded in Will Book 32, contains an affidavit of the executor at page 503, stating that the original will and Will Book were destroyed in April, 1865. There was also a letter written by a Union soldier around 1900, and mentioned in the local paper, The Caroline Progress, in an article written during World War II, stating there were court papers loose in the street during April 1864, when the Union army passed through Caroline County. Additionally, the parish registers and vestry books for each of the three colonial churches are lost and presumed destroyed. The parish registers would provide genealogical data in the form of marriage dates, birth dates, baptism dates as well as death records. These records have not been mentioned in any history [Wingfield's or Campbell's], nor have they surfaced in the Library of Virginia, the Virginia Historical Society or any similar collection, public or private in over two hundred years. Kay, James, 25 Apr 1768/20 Feb 1767? Caroline County, Virginia 'Lost' Wills, 1676-1855 and Related Records from other Sources: Volume Two 8 1/2" x 11" format, xv, 269 pages. Abstracted by Kimberly Curtis Campbell, 2013. A continuation from Volume One. Caroline County, Virginia 'Lost' Wills, 1676-1855 and Related Records from other Sources: Volume Three 8 1/2" x 11" format, xv, 187 pages. Abstracted by Kimberly Curtis Campbell, 2016. A continuation from Volume two. Caroline County, Virginia 'Lost' Wills, 1667-1853 and Related Records from other Sources: Volume Four 8 1/2" x 11" format, xii, 257 pages. Abstracted by Kimberly Curtis Campbell, 2017. A continuation from Volume three. Reuben Broaddus, /d. bef. 31 Oct 1839, EFD, (add. info., orig. in Vol. II. Col. William Campbell, /d. 23 Oct 1823, King & Queen & Orange Co.’s. Joseph Fogg, 11 Sep 1781/19 Jun 1786, Essex Co.
CAROLINE CO., VA 1810 CENSUS transcribed by John Vogt. 10 1/2 x 8 1/2, x, 25 pages, illustrations, maps. This is the first surviving census for Caroline, since both the 1790 and 1800 censuses have been lost. The manuscript is transcribed in its original rough alphabetic form. 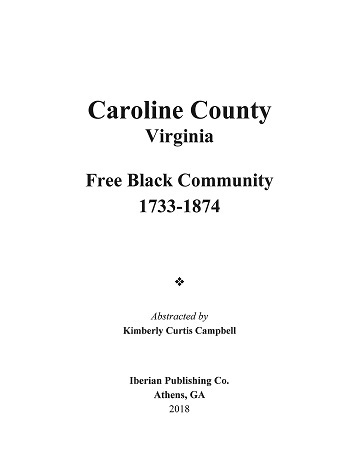 Caroline was an important county with a heavy slave population, and the census record covers 1154 households. The county's settlement dates from the mid-seventeenth century before the official county formation in 1728, and many of the early families later migrated westward into the Piedmont and Shenandoah Valley area. This document should be a complement to the fine work of Roger Ward (below) on land taxes in the county. Caroline County, Virginia Court Records: Will Book 1793-1897, Will & Plat Book 1742-1840; Will Book 19, 1814-1818 8 1/2" x 11" format 71 pages. Abstracted by Kimberly Curtis Campbell 1998. This volume contains the earliest extant wills for Caroline County bound in book form and located in the courthouse. T. E. Campbellþs Colonial Caroline, A History of Caroline County, Virginia, abstracted the will information from year 1732 through October 1781. The forthcoming second volume of this series will try to fill in the þrecords gapþ that exists by using the Court Order Books from 1781 to 1854. During this time only Will Book 19 is extant, and it is included in this first volume. The original Will Books start again with number 29, beginning with the year 1853. It is the author's intent to eventually have all of the Will Books abstracted through the year 1925. CAROLINE COUNTY, VIRGINIA COURT RECORDS PROBATE AND OTHER RECORDS FROM THE COURT ORDER AND MINUTE BOOKS 1781 - 1799 transcribed by Kimberly Curtis Campbell, 8 1/2" x 11" format, index, 285 pages, 1999. Begins March 1781 and continues through April 1785. Begins May 1785 and continues through March 1787. Begins April 1787 and continues through May 1789. Begins 1787, the abstracted information from this book begins June 1789 and continues through September 1791. 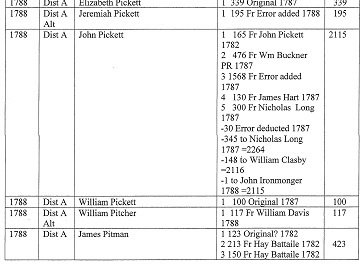 1794 are among the missing records of Caroline County. The abstracted information begins with September 1799 and ends December 1799. The third volume of my series will pick up with January 1800. Caroline County, Virginia Court Records Probate and other Records from the Court Order and Minute Books 1800 - 1804 Volume III by Kimberly Curtis Campbell, Copyright 2003, vi, 146, complete every-name index. This third volume will try to fill in the þrecords gapþ by using the Court Order and Minute Books from 1800 through 1804. Names of people and places are transcribed exactly as they appear in the record. No attempt has been made to correct any spelling or grammatical errors, so try variant spellings as you search the every-name index. Look for your ancestor in the Probate Chapter, then follow the records from the Will or Administration Bond through the final Order to settle the Estate. You may also find several Chancery Suits which may be of help. Did your ancestor serve in the Militia? Check out the County Militia section. There are also Chapters on Civil matters, Guardian Bonds, Manumissions, the Tobacco Warehouses, the Courthouse and Prison upkeep, Processioning, Overseers of the Poor, Overseers of the Road, Sheriffs and other Officers, the Justices and more. CAROLINE COUNTY, VIRGINIA 1850 CENSUS, transcribed by Mark Anderson Sprouse. 1997, iv, 182 pages, index. Caroline County Virginia was formed in 1727 from parts of Essex, King and Queen and King William Counties. It is a strategic county for geneologists because of its location. Many colonial Virginia ancestors settled or "passed through" Caroline. The 1850 Caroline County Census was enumerated by Thomas T. Chandler. Mr. Chandler's work has numerous legibility and spelling "problems," as well as what appears to be a few bonifide errors. Mr. Chandler must be forgiven. How was he to know that as he traveled the roads of 1850 Caroline, that every letter he put down would be under extreme scrutiny by future researchers. Chandler's writing is often difficult to discern as t's are uncrossed confusing them with unlooped l's, a's are not closed and might be u's, i's are often not dotted and can't be distinguished from unlooped e's and similar problems. Even more frustrating for me were the names that were clear but didn't really make sense; as letters seem to be excluded or extra ones added. An example of this would be the several families that have different spelling within the household such as # 897 with "Bird" and "Byrd" or # 1014 with "Garnet" and "Garnett". In the case of the few names that really didn't fit, the transcriber entered it as it appears in the census unless he could find the spelling for that specific name in at least two other sources. Readers are reminded that the burden of proof remains on the researcher and therefore consult the original record when in doubt. The Name of every Person whose usual place of abode on the first day of June 1850, was in this family. Profession, Occupation or Trade of each Male Person over 15 years of age. Place of birth, naming the state, territory, or country. Married within the year, attended school within the year, persons over 20 years of age who cannot read or write. Whether deaf and dumb, blind, insane, idiotic, or pauper. CAROLINE COUNTY COURT RECORDS, 1742-1833 AND MARRIAGES, 1782-1810 by William Lindsay Hopkins. vi, 219 pages, index. A valuable collection considering the great loss of documentation suffered by this county. Caroline County was established in 1728 from the upper portions of Essex, King and Queen, and King William counties. Some further territory from King and Queen County was added in 1742 and 1762. There have been no further boundary changes. since then. Caroline Co. 1815 Directory of Landowners by Roger G. Ward. 2005. 26 pages, map, 5 1/2X8 1/2. Caroline Co. Revolutionary Public Claims transcribed by Janice L. Abercrombie and Richard Slatten.. 2005. 100 pages, 5 1/2X8 1/2.